Ever look back on a year and wonder how you got from the beginning to the end? Or you can’t believe that a January like that led to a December like this? I can’t write life this good. If you were to ask me what I needed in January, I would’ve said: a home, a job, direction, and hope. Oh, and an attitude adjustment. I am pleased to say that the year delivered and when I reminisce with those who were present for the first months of this past year, we are in awe of all that can happen in one year. I could still use an attitude adjustment right about now but I think that’s pretty standard. In January I was fresh off of the only identity I really knew for six and a half years: university student. Armed with my teaching degree and no prospective employment, I think I spent close to two months rethinking…analyzing…overthinking why I got that piece of paper to begin with. Discouragement can do that to a person. Oh well. With much gratitude to a dear cousin and his even dearer wife, I was blessed to hang my hat in their home for awhile as I tried to figure out what to do. I had no job, my car was broken, and my spirits were pretty low – I can honestly say January was THE hardest month of my life and without Trav and Chrissy, I don’t know where I would’ve been – literally/mentally/emotionally. They seemed to know exactly what I needed and I don’t think thank you would ever suffice. Looking back, it was a good time – but there was only so much cross stitching, Coke float drinking, good food eating, Canucks cheering, and Kary watching I could do before true lack of fulfilment set in. OH but then I got a job. Two. I was blessed to be given an early spot on the teacher on call list down on the Island where I got to try my hand at teaching as a substitute. It was interesting, I had a lot of laughs and got to spend a lot of time TOCing in my practicum school which was fun for me and the kids who knew me. I also worked “full” time (any time they were open, but part time in hours) at a learning centre, teaching kids in an after school program. Work was sporadic and I made enough to survive, but not thrive. The year started to pick up a bit. Still found time for fishing trips, Canucks watching, and Blue Buck Growler nights but I still wondered on a day-to-day what I was supposed to do and how I was going to do it. Not a fun feeling. It was as though life was going on around me but I wasn’t really able to take part. I thought I was going to stay depressed forever. That’s a real thing. Sometime in April I interviewed for a Kindergarten teaching position in my hometown. My attitude to the interview was “I am just doing this for experience” so I didn’t think much of it…me? Kindergarten? Heck no. Lo and behold, they called a week later with an offer of my current job. Grade 7…still young but had potential for awe-some. I didn’t know how to respond. I was starting to enjoy my subbing gig. And still remained committed to staying on the Island at whatever cost. But the offer was too good and my heart was too settled and my life was too unstable to not say “yes”. After counselling with those who mattered most, I accepted the job just after Easter and spent the next two months doing fun things like graduating university (yea I did!) and hiking around Thetis Lake and sad things like breaking my toe and saying goodbye. I left my cozy little suite at the end of June, just in time to spend a summer with my parents, Jayme, and the members of the all-too-familiar regional district, planning the municipal election again…making money, distracting myself from moving from my home and missing people in Victoria, suntanning, and trying to navigate grade 7 curriculum as September loomed way too close. August came too quick but when doesn’t it for teachers or students? 🙂 Just when I thought I had experienced enough change and years worth of prayers, the phone rang with a surprise that absolutely changed the course of the year; on the other side of the line was something I had learned to live without but was always pretty sure I’d be better off having around. In the course of this, I’ve relearned all sorts of ways of a friend (both how to be one and how to receive one), especially forgiveness and humility and honesty and humour and kindness and unguarded trust. I’ve also learned, again, how nice it is to be truly known and how laughing can make all the difference. I didn’t think I missed it as much until I had it again. Armed with the support of that plus confident determination (and to a certain degree, preparation), I moved back to my northern hometown, ready to embrace a new life: a career job, a home in the woods, and winter (something I hadn’t truly seen since living in Calgary five years ago). Now here I am, 4 months later and overwhelmed by the blessed end of my 2011 year. I am not going to sit an explain the events, continuing phone conversations,life with a wood stove in the woods, learning how to teach, etc. I don’t know what I did right along the way, but I couldn’t be more stunned by the course these months have gone. I get to go to my dream job every day and see kids that I love spending hours with. I get to live in a place that is sometimes all too familiar that I have to double check at times that it’s not 8 years ago. I’m loving reconnecting with old friends and being reminded of their importance in my life…same with family. The familiarity is hard at times and sometimes it feels like going home is going backwards but the nice part is that I don’t feel like it’s home anymore so moving forward is easy to vision. We’ll see. I don’t even know how to be grateful for what I have. I find my heart changing and growing as things aren’t as easy as they used to be or familiar parts (relationships, routines, what have you) all of a sudden feel foreign and hard to connect with…I don’t really know how to describe that part…but to say that 2011 caught me off guard would be a massive understatement. This year felt doomed to disaster but here, on the verge of a new one, I wish I had been a little more optimistic…because I can’t believe where I am today – what I get to do and who I get to spend my time talking to and connecting with…and I don’t just mean my 25 students. It’s been a really good year. Teaching, learning, growing, surviving, loving, trusting, forgiving, laughing, visiting, challenging, and being humbly reminded of the fortunes in my heart – I am totally taken care of and thought of, and I think that is why I am in awe of what’s taken place. I miss a lot, people and places in Victoria especially – I didn’t think I could survive without! But here I am. Like I said above, I couldn’t have written a year this good. Or scripted overwhelming gratitude any better. I still haven’t “arrived” – if I did, what would there be to look forward to in the new year? Really. Categories: Rooted, Unfolding | Tags: Anecdote, Dave Matthews Band, Streaming Thoughts | Permalink. Actually, I am just looking for more excuses to play on my new MacBook. Fun! I am settling in. That’s probably the best way to describe the monotony of newness in my life right now. “They” say that it takes about 6 weeks before the routines and expectations of being a teacher “click” and everyday doesn’t seem so difficult or tiring. Well, just like when I learned how to drive a standard, it took me closer to 8 weeks but I am finally feeling like I am not run off my feet EVERY single day. Honestly, I have the best class imaginable for my first year – but with report cards (what I am supposed to be doing now), parents, trip planning, assessment, and simply preparing for every class, it is exactly what I mentioned above: monotony of newness. – I tried to make the kids caramel apples for hallowe’en. Mom used to do this for all of us kids and a few of our friends every year and since I am teaching at my old school, I thought I would continue the tradition. Unfortunately, in my quest to make the caramel soft and delicious, the caramel sagged right off the apples. The kids didn’t care but, as Jack’s caught, aesthetics to me is everything and I was devastated by how gross they looked. – My class lead the school in the Remembrance Day celebrations and, after looking at the agenda from years past, I decided to do away with the seemingly-obligatory-but-not singing of “In Flanders Fields” and made a video of my class talking about what freedom and remembrance mean. The video was followed by a somber reading, some sharing of words that represent freedom, and my darling girls singing Sarah McLachlan’s “I Will Remember You”. I might be biased, but it was POWERFUL. It was an incredibly silent and respectful event as I tried to work with my kids about getting away from thinking of Remembrance Day as remembering war and more of remembering the price that has been paid. ANYWAY, I want to provide you with the video of the service but you’ll have to ask; I can’t post it online. I am so proud of those kids. – Letting go. I know it sounds silly but just as I’ve made a turn in my comfort in teaching, I’ve also been able to relax a little bit on being stern. That is not my first nature as a teacher so now that routines are set, I am easing into being a little less strict and a little more Kate. Yes. That is what I’ve been waking up to! Can you believe it? I am grateful that I am now driving that white SUV there (a RAV4 for inquiring minds) instead of my old dear Bella – who I sold, fortunately. The cabin living is growing on me. I am having a relatively easy time maintaining the fire and not waking up to every gunshot or growl or engine revving that goes on out in these parts. There is also a resident bear. I think things would be different if I lived out here on my own but my friends whose property the cabin sits on and their two kids have been such a blessing; I am enjoying the laid back life of living in the woods. Except the horrible cell service and Internet connection. Oh well, not the end of the world. I am 45% done my Christmas shopping! I am so excited about this endeavour this year; having two nephews makes it double the fun. And more than that, I am anxious for Christmas in all ways. I can’t wait to skate on Lake Kathlyn and see Luke and Joce and sweet Annabelle again and – ahem – have my kids be the starring class in the Christmas pageant…all before going home for 10 days to my family and being cozy in Penticton. I can’t believe it’s almost upon us; I am grateful for what 2011 has brought me… the list is so long. That’s the catch up for today – more to come. Categories: Adventures, Characters | Tags: Anecdote, Bella, Friends, Grade 7, Growth | Permalink. While I am staying with one of my littlest buddies, Eli, one of my favourite things to do with him is watch ‘Super Why!’ in the mornings. Sometimes, Chrissy will even shoot me an instant message reminder that it is on at 9 am. (Or 8 am on weekends which I didn’t know until I missed it). 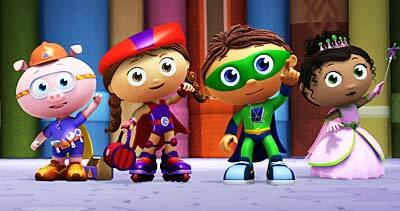 Ripped right off of the website, ‘Super Why!’ is the animated television series and interactive website that helps children ages 3-6 learn key reading skills, including alphabet, rhyming, spelling, etc. (which makes Eli a rockstar already since he’s not even two and Kalli is only a few months). It also makes me feel like a total dork but I digress. The title character introduces himself as “Whyatt”, and welcomes the viewers to “Storybook Village”, a place where all fairy-tale characters reside. Then Whyatt hears a ringtone from his “Super Duper Computer”, which resembles a small red PDA. He answers the call and discovers that one of the other characters has a “Super Big Problem”. After investigating the nature of the problem, Whyatt summons the “Super Readers”, sending out the call: “Calling all Super Readers! To the Book Club!” The four characters, Whyatt, Pig, Red Riding Hood, and Princess Pea, then appear in front of the aforementioned Book Club, which is a building made of books. Whyatt then tells the viewer to “say YOUR name”, including them among the Super Readers. The goal of the Super Readers is to follow the storyline to solve the problem. As they progress through the events of the story, they encounter obstacles, which can be solved by applying their literacy skills to change the story (for instance, changing the prince in “The Frog Prince” back into a frog because the princess liked him better that way). As they overcome these obstacles, they are rewarded with red glittery “Super Letters”. These Super Letters are then uploaded into the Super Duper Computer, eventually forming the word(s) that make up the solution to the Super Big Problem. The audience members are encouraged to look for Super Letters throughout the story, and to identify them when they appear. Anyway, the show also fascinates me because I am a slight fan of ‘Wheel of Fortune’ and ‘Jeopardy!’ so I like to try to solve the puzzles before they find all of the ‘Super Letters’. I think I like it more than Eli does. If I consider this similar to the FBI Behavioural Analysis Unit from ‘Criminal Minds’, somehow it gets more interesting — although, rather than solving murders and weird crimes involving clowns, the Super Readers hang out in STORYBOOK VILLAGE and solve SUPER BIG PROBLEMS using their literacy skills and a SUPER DUPER COMPUTER and saying things like ‘PRESTO!’. Really. 1. How do we get a cat unstuck from a tree? 2. How do we get Whyatt’s baby sister to stop crying? 3. What should Red have done instead of just taking Peter’s pickled peppers? How can Kate get a teaching job? Or any job? Yes. If you find the glittery red Super Letters to solve that puzzle, please… help me out. Otherwise, I am destined to mornings watching Super Why! with Eli. Forever. Categories: Characters | Tags: Anecdote | Permalink. ALSO: I edited the OTHER movie that I posted a couple weeks ago so you should be able to watch it now… it’s hilarious. Categories: Unfolding | Tags: Anecdote, Teacher Girl | Permalink. For our summer institute courses that I am taking right now we’re doing video literacy. My group and I decided to have a little fun, lighthearted approach to the topic. We filmed the footage and edited on our own… huge feat for us uneducated and tech-motivated teachers. Disclaimer: the video is really poor quality… we had to compress it and make it smaller in order to post it to the web so that’s why it’s a bit blurry. Sorry! Enjoy! Categories: Adventures, Characters | Tags: Anecdote, Friends, Teacher Girl | Permalink. and for the next 10-15 minutes they had to predict future events of the world and furture events for themselves. There was no time limit, they could predict as far into the future as they saw for both timelines. Once they filled in their timeline, I drew a long line on the board and each person came up and wrote one thing from each portion of their timelines. As you can imagine, they dreamt up some pretty inspired goals and predictions for themselves — everything from getting their driver’s licenses to writing bestselling books to becoming snowboard champions and prom queen. On the other hand, their predictions for the future were very dismal…running out of water, wars over resources, wars period, the world spontaneously exploding, people assassinated, hate crimes, amalgamated religions into one dominant ideology, and the list goes on and on and on. WHY… (they stopped talking)…do you think that our predictions for our own futures are positive and exciting and filled with hope, dreams, and ambition BUT our predictions for the future of the world are dismal, dark, scary even? I think it’s because we are selfish and we can’t see outside of our own little bubbles. It went on and on and on. It was incredible. I was thrilled and couldn’t believe the connections they made for themselves once given the chance. My last question about the timeline was contingent on the final date listed. The last prediction was set for 2065. Perfect. So, after all of that — why do you think that we, selfish and unaware, grade 9 students were only able to predict until 2065, anyone have any ideas? Duh Miss Stam, selfish people can’t see past their own lifespan. So we only think of what we’re doing and just do it, forgetting the bad impact it might have on the world… But that is unfair to my kids and their kids and the rest of the people in the world that will live longer than 2065, isn’t it Miss Stam? 1. I have a lot of changing and learning to do — my world is far too small right now if I want to be a part of the big world in a big way. 2. I am NOT ready to have kids — clearly, I have to figure out some stuff first. Categories: Characters, Unfolding | Tags: Anecdote, Students | Permalink. I’m trying to decide how I feel about this career choice. There is so much work involved in preparing and creating and deciding and learning all the material that needs to be covered for even one 80 minute period. I spent all weekend crafting my introductory lesson to Macbeth and before I walked out the door on Monday, I told Mom I was afraid that I had too much to cover/expected too much. I was surprised to find we covered everything and more over 70 minutes, leaving 10 minutes of “oh no, what now” ringing in my head. And it’s not just the preparation, it’s the teaching. It’s a difficult task to comprehend something my self so entirely thoroughly before I teach it so that I can ensure my kids will understand it the way I’ve decided they need to. Again, how I decide. Shakespeare is hardly my second language, so expecting 19 grade 11 students to have a love affair with it themselves is a bold request — so my goal is to simply challenge them to give it a chance. However, remember when your teachers in high school or beyond talked about staring into a sea of glossed over eyes and stunned looks of “what the heck are you talking about”? It’s the truth. High school = a whole other world. In a week, I’ve learned many things. I have learned that while one lesson and day might go perfectly according to plan, successful both in delivery and student engagement, the next day might be a fail beyond repair. Then the next day, I won’t even recognize the faces that stare at me in earnest… ready to learn. It’s constantly changing and dynamic and unpredictable… they weren’t kidding when they said to be prepared; and be prepared for anything. I’m also learning that I can’t take things personally. I am so far off the kids’ priority radar that even if I bomb a lesson in my head, they aren’t the wiser nor will they remember the next day. They have boyfriends, girlfriends, after school job, drama, sports and the playoffs, TV shows, obsessions with Justin Bieber and Lady Gaga (oh yes! ), break ups and make ups to deal with — far more important than Miss Stam whose knees have gone weak and stomach flip-flops when they haven’t been able to answer three questions in a row as my mind races with insecurity. So as I learn that I can’t take things personally, I am quickly learning how much I truly do carry burdens, of all sorts, in my heart. Seems like more lessons than just for teacher me. I’m learning tricks of the trade — how to be friendly without being friends, what battles to fight and battles to ignore, and the list goes on and on. I have been blessed with a great group of kids who genuinely seem to enjoy me, which has made this a much more enjoyable transition. My 9s, who I get in a week and a half, seem a lot more distant and a lot harder to please or engage, but they are even more concerned with Justin Bieber than my 11s so I am not too worried. To say I am humbled is an understatement. In fact, as an English teacher, I feel like I should invent a word that describes how I feel since I can’t seem to come up with the right one. High school students make me so happy… they are funny and obnoxious and emotional and thoughtful and careless and innocent while being experienced and almost wholly real. I know, I know, when you think of your own high school experience, you remember the fake parts and the cliques and insecurity or whatever else there is and I know that all exists. But when I am standing there in front of the room and there are 19 people sitting there, waiting to hear what I have to say, trusting me (albeit, not by choice) and respecting me and opening up to me, well, it’s much easier to see high school students for who they are when you’re teaching them, not being their peer. Make sort of sense? The stories are already piling up, the comments and anecdotes and encounters are too hilarious to attempt to put into words — plus, I don’t want to privatize my blog so we’ll have to just save those for a coffee date one day. I’ve now had two official evaluations. One by a university supervisor and one by my mentor teacher and they both went super well. The things I have to work on are minor, mostly about disciplinary tactics (being a bit more harsh) or waiting a bit longer for them to answer questions but all in all, I think I am doing well. Learning lots but not excelling — and in so many ways, I am glad I am not. I think humility is a huge, if not the biggest, part of this job. And realizing that it most definitely is not all about me, and I like that. Categories: Narcissism, Rooted, Unfolding | Tags: Anecdote, Blessed, Change, Dreamin', Teacher Girl | Permalink.